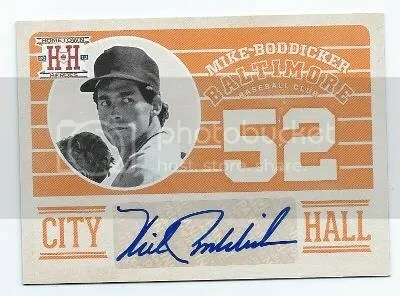 This contest is for a Mike Boddicker 2013 Panini Hometown Heroes – City Hall Auto. Good luck!!! This contest will end Friday, November 29, 2013 @ 8:00 p.m. EST. In for Sunday. Thanks for the contest. Happy Thanksgiving. It wouldn’t let me post for yesterday.